This trial-size skin care set combines both of our popular creams and our light polish exfoliant, plus a 1oz Peppermint soap to try. 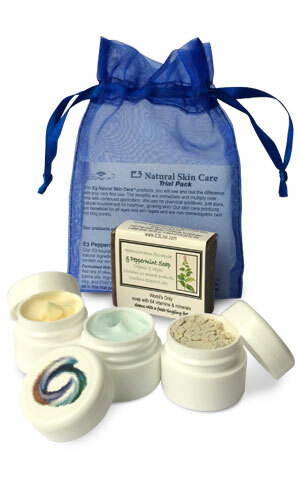 Sample the benefits yourself or give them to a friend as an enticing introduction to E3Live's natural beauty products. Tamera E3 Light Creme - new & improved formula with Maracuja Oil, Argan Oil and Hyaluroic Acid. Plus more Algae extract to lift and tighten skin. This popular Paraben Free protective natural crème with organic ingredients also contains 100% organic orange oil, plus Vitamins A, C & E, making it the best anti-aging cream on the planet. Use for Cellular Enlightenment, and Age Reversal & Rejuvenation. E3 Light Polish - a herbal dry cleanser for normal, oily and dry skin forumlated for men and women. A rejuvenating exfoliant gentle enough for everyday use. Tamera E3 Earth's Essential Crème is a superior moisturizer for dry, chapped skin, men's and women's formula. Our Tamera E3 Earth's Essential Cream is the ultimate formula for skin that thirsts for moisture. E3 Peppermint Soap - from our E3 Nourishing Soap line. Filled with essential oils of peppermint, clove, and juniper, this blend also contains saponified oils of olive, coconut, and palm, and is superfatted with castor and almond oils. Ingredients also include: peppermint tea and leaf, bentonite clay, and E3AFA. Nourish your body outside as well as in. Contains NO chemicals, dyes or animal products. Handmade in the USA. Please refer to the individual product pages for ingredients. Super nice, great for travel. The night cream is thick and refreshing, while day cream is light and perfect for work. Love it and will be reordering soon. It works great on my sensitive skin. Very nice feeling on the skin moist not oily, just a great product for the skin. Love all 3 products, If only the exfoliant came in a better dispenser for the shower area, the powder in the bottle gets wet while i am shaking it into my palm... great products!!! The Light Cream seems to have brightened and improved my skin in a couple of weeks. It absorbs beautifully (I am using the products in the Trial Pack along with 2 oz. daily of E3Live). The Light Polish makes my face feel wonderfully smooth and supple, but it's very easy to get the unused powder wet. It works better to transfer it into an old spice bottle in order to tap the powder out without getting water into the little jar. I really like the concentrated feeling of my skin taking in the Essential Cream, but the Rosemary scent is too intense for me. I absolutely love the travel pack! It's perfect for any time I fly and for everyday, since I'm always on the go. I use the Light Creme on my face on 'dry days' and the richer moisturizer for dry irritated knees and tops-of-feet (if you do a lot of hot yoga, you'll know what I mean!). The exfoliating grains give me that satisfying 'I'm exfoliating' feeling without scratchy synthetics or chemicals. Loved this trial pack! I have never had such immediate results from a skin care line before. The Polish can be tricky but just make sure to mix it with only a bit of water and use very light circular motions when applying to your face. If you rub too hard, your skin will be pretty red. Overall a great way to try the skin care line. I love all three products and this is a great way to start using the products. I have given this trial pack out as gifts to my friends just so I can share the great results with them. You will LOVE these products. I purchased this skin care pack. I am a former skin therapist and did not think my skin needed much improvement..but after trying this I realized how wrong I must have been because my skin has an amazing radiance to it. Too it makes my skin brighter. Have ordered the larger bottle and will gladly make this part of my daily skincare regime.